I have ALWAYS adored Chocolate + Orange flavouring together – especially Terry’s Chocolate Orange – it sounds like an odd combination at first if you haven’t tried it, but once you have, you will never forget it! Literally my favourite chocolate! When I was little, I would eat at least 3 a week (I realise this is bad, but I ate plenty of healthy stuff too!!). I have always baked big cakes and used chocolate orange, and then cupcakes as well – but when I went to the supermarket with my boyfriend recently and he picked up a bag of Terry’s Chocolate Orange Cookies to buy, I realised I might as well bake them at home myself so I know exactly what is in then, and sometimes it works out much cheaper! – Turn out this is the best decision I have ever made. Seriously though, I know you all love and adore Terry’s Chocolate Orange – hence the love for the No-Bake Chocolate Orange Cheesecake that I posted a few months ago – my second most popular recipe on my blog! 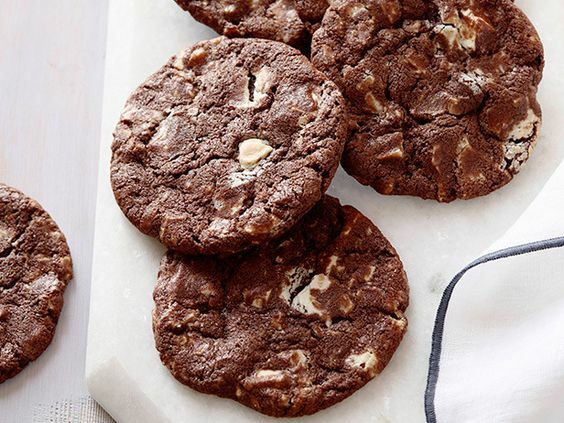 These cookies are the perfect combination or crunchy edges and gooey delicious centre – its a winner all round! These cookies are always perfect to bake around Christmas time, or when you are just craving something utterly delicious. The perfect part about them is that the oils in the Chocolate Orange that creates the flavouring, makes the cookie bake perfectly every single time – I have honestly never had a problem with these! Enjoy! 2) Mix together the butter and sugars until light and fluffy and thoroughly combined – I often use an electric mixer for this bit as it makes it so much easier and combines the ingredients very well – but good ol’ manpower will work too! 5) Spoon the mixture onto the trays and make sure they are suitable spread out so they stay separate! (I usually fit 6 on each tray to be safe) I also use a cookie dropper/ice cream scoop to make them identical sizes. 6) Bake in the oven for 10-12 minutes – if you want to put a piece on top then add it and bake in the oven for another 1 minute – it’ll make them super gooey! 7) Once baked, remove from the oven and allow to cool slightly before gobbling up otherwise you might burn yourself on molten chocolate!